Summer is the perfect time to hit the road or hop on a plane. We love to travel as often as we can and while heading out on trips can be relaxing and rejuvenating sometimes summer travel planning can be make you say, “I need a vacation from my vacation and we haven’t even left yet!” That’s why I’m excited to be a Windows Champions Blogger and to share with you 10 Great Ways Windows 8.1 Makes Summer Travel Planning Easier & More Fun. Power and search buttons on the Start Screen. You can find them in the upper right hand corner next to your picture. No need to go through the extra motions of opening up the Charms bar anymore. This is a real time saver. Go to the Desktop when you sign in instead of the Start Screen. If you work mostly from the Desktop this will be a real timesaver and I know one that will make a lot of family travel planners very happy. With the new update to Windows 8.1 you can search apps right from your Start Screen and thanks to Bing Smart Search the apps are faster to find. Once you start typing your search suggestions will immediately begin appearing. 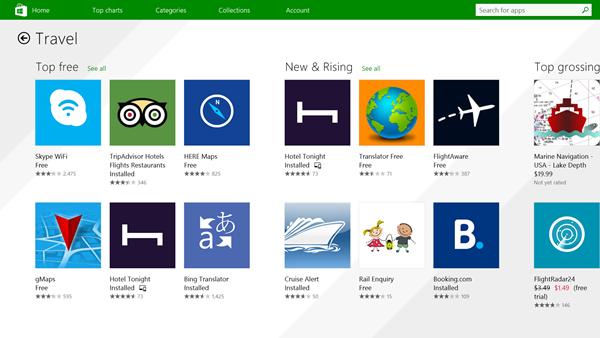 Your Start Screen also points you to the newly installed apps so you don’t forget about all the great apps you have. When traveling you want make sure you capture all the memories you can and using your Windows Phone camera is one of the best ways to do that. When you want to make sure those photos look there is good news. 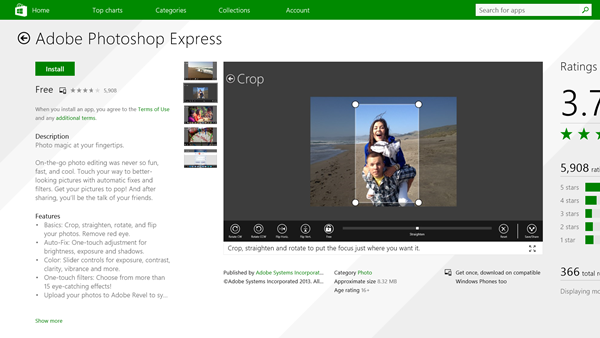 Adobe Photoshop Express has come to the Windows Phone. You can edit photos quickly with features like crop, straighten, rotate, flip, and red-eye removal. There are also easy to use slider controls to brighten, adjust exposure, and pay with shadows. 20 “Look” allow you to apply one-touch filters. Once your photo is picture perfect you can easily share to Instagram, Facebook, and through SMS Text. 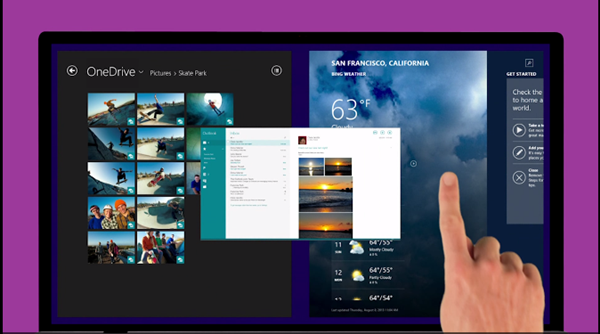 OneDrive is free online storage and it’s built in to Windows 8.1. It allows you to store documents, photos, and videos and you can access them from any of the devices you use. This is perfect when you are vacation planning and inspiration hits while on the go. You can jot down notes from chatting with a friend who’s traveled to the same location in the past, keep your final shopping list up to date, or store all your reservation info in one place. While traveling you can put your photos and videos in OneDrive and then access them on the go or when you return home. We all know when trip planning how confusing things can get when trying to make reservations for flights, hotels, meals, the theater, or excursions. The good news is Windows 8.1 allows you to snap up to four apps side-by-side to make planning your summer getaway even easier. To do so open up to four of the apps you’d like to snap. Slide in from the top left of the screen to see the first app, drag the app to the left or right side of the screen. Use the middle slider to change sizes of the screens and add up to four apps. That’s it. Now you have 4 apps you can view simultaneously for trip planning ease. 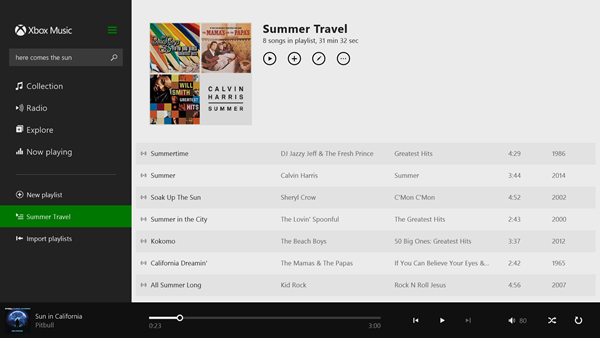 Xbox Music can provide some of the top tunes for you to sing along to while planning your trip or once you are at your destination and relaxing on the beach. It’s a fantastic service that allows users to listen to music across their devices. It’s an all-in-one streaming service that combines the best of free-streaming radio, music subscription services, and music purchasing options. 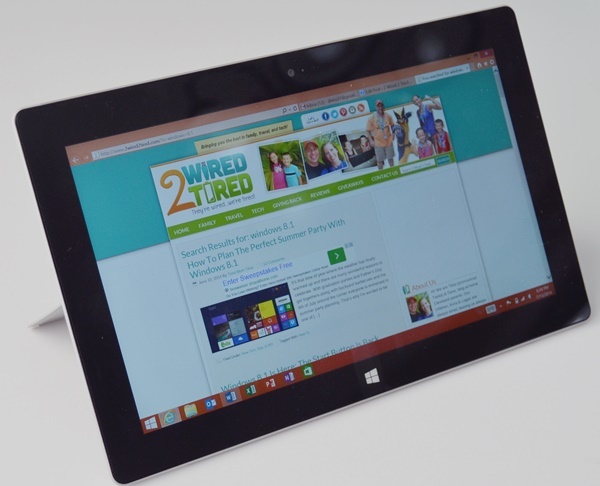 You can listen to individual songs or entire albums for free from Windows 8 based PCs and devices. You can also create playlists to provide the best roadtrip mixes and beach tunes for tapping your toes to. 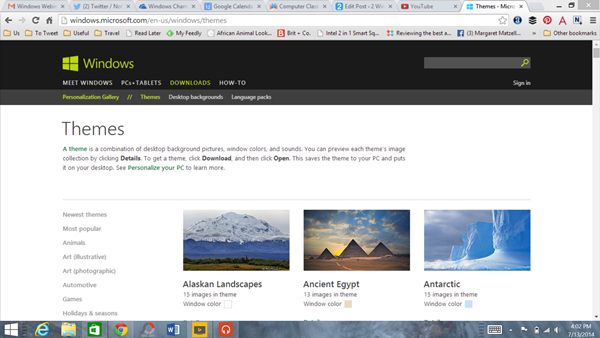 Windows Themes are combinations of desktop background pictures, windows colors,and sounds. You can view a beautiful gallery of themes here which include photos and inspiration from beautiful destinations around the world including: Beautiful Britain, Panoramas of New York, Alaskan Landscapes, Panoramas of Europe, Perspectives of Japan, and many more. These themes are the perfect way to day dream about your upcoming trip and get everyone in the traveling mood. Not too long ago I remember making my way through the airport with a large laptop. It doesn’t sound like it would be that big of a deal but honestly it was a huge (pun intended) pain. The real problem came when I sat in my seat on the plane. It was too big to use while flying resting on the tray table so I thought I’d tuck it under the seat in front of me. It was a struggle to get it to fit. Now this wasn’t a problem a few years ago, but as you all know individual space on airplanes is getting smaller and smaller. I had no issue sliding this same laptop under the seat in front of me just a few years ago and here I was seriously struggling to make it fit this time around. That’s why I love the Surface Pro 3. It’s the tablet that has replaced our laptop. It’s small but mighty. It does everything we need it to and it fits nicely in my purse. I can work from it from the airplane tray table or slip it into my purse and easily slide it under the seat in front me if necessary. I can watch movies on it, blog, and Dave uses it for work when traveling as well. It’s a wonderful device to have in the air and at your destination. 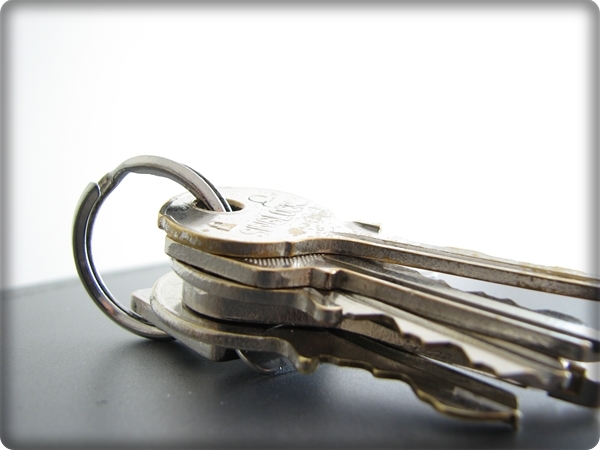 It fits in hotel safes too (which have you noticed as well how much smaller they are getting?!) and is very handy to have along on a trip for work, play, music, and staying connected. Once you are on your trip you want to preserve those memories for years to come and one of the best ways to do that is by shooting HD videos with your Windows phone. What can you do with those videos once they are recorded? You can share them instantly on social media, you can upload them to OneDrive, and when you have downtime in your hotel room or when you return home you can edit them and turn them into keepsakes with Windows MovieMaker. These are some fantastic ways to help make your summer travel planning easier and more fun. Now that I’ve pulled these all together I can’t wait to get started planning our next trip!! What about you? Where are you headed this summer? 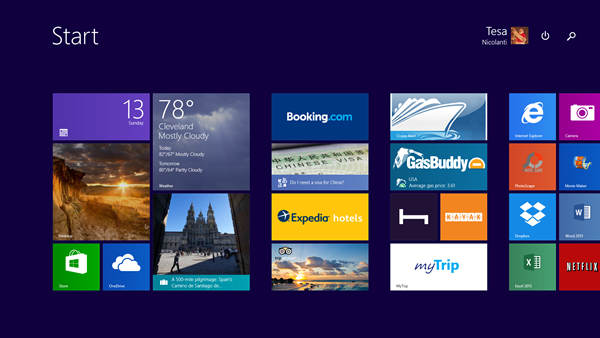 Which of these Windows 8.1 suggestions would make your summer travel planning simpler? Products provided. The honest opinions are my own. Wow! Lots of great apps for making your travel plans! it is great that you can get the same experience across all of your devices. the apps are also being slowly developed so it is getting better by the day. i would love have a windows computer, tablet and phone so i could have consistency across the board. Thanks for all the great tips. I probably need to update to Windows 8 soon. We were planning to visit our son in South Carolina, but he moved back home. So, we’ll be spending some time by the river, cookouts, swimming and canoeing. 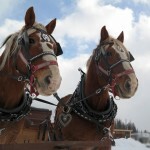 I have a Windows phone and love using the One Drive for storing our photos. Amazing! 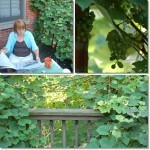 So much information right at your fingertips ..and lots of great savings sites listed, too. Thanks! Definitely will have to check out!! I did not know about this! We are about to drive across the entire country and this information could be quite useful. I particularly like to geek out on weather info. Cool but I’m a Mac man. We just bought a new computer that has Windows 8. Will have to check this out! This does look great with windows 8.1! i am a researcher and planner , will definitely have to check this out! This would be really handy for our trip to the beach. I just updated to 8.1, I will have to check out these options. Dont really have any plans for the Summer. I like the way you can put the aps side by side. It’s great to get some help on trip planning. Easy is good! No trips planned. Went to Santa Fe a couple of weeks ago for the opera. I have an iPad mini that I took with me. I love having everything planned before I leave. I am so thankful for the resources! I love Gas Buddy! These are all great travel tips. We love Windows, thanks for the tips. I haven’t upgraded to 8.1 yet, but after reading about all it can do and how much it could help me, I surely will. Well, I will have my son do it for me. This has lots of great features! Definitely upgrading to Windows 8.1! We are headed to FL in a few months to visit family we haven’t seen in a while. I ove using my windows 8! Great features!